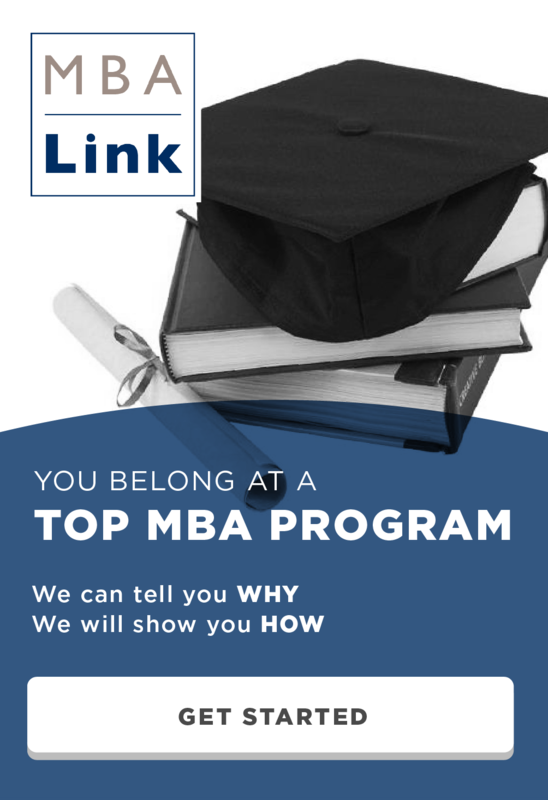 Tuck School of Business is a top MBA program with a competitive admissions process. The Tuck acceptance rate is low, at 20%. Unlike most other top MBA programs, Tuck is a self initiated interview. Anyone who visits campus can schedule an interview. 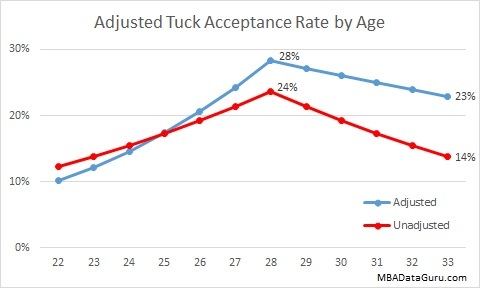 In this article I will discuss which factors impact Tuck acceptance rate. 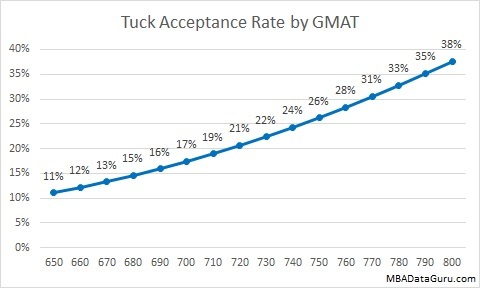 GMAT score has a large influence on Tuck acceptance rate. The average Tuck GMAT score is fairly high at 716. Adding a hundred points to your GMAT more than doubles your chance of admission. Even with a low GMAT of 650, acceptance rate at Dartmouth is still more than 10%, unlike Harvard where you need a 740 to have a 10% chance of admission. The average Tuck GPA is a solid 3.5. It is clear that applicants with a higher GPA have a better chance of being accepted. Once graduated, GPA is set in stone, so you might as well focus on increasing your GMAT which can still be increased. 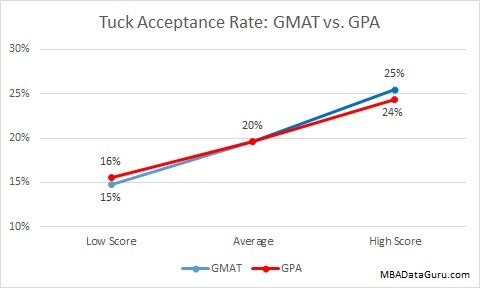 Next we look at whether Tuck prefers a high GMAT or a high GPA. The graph above shows that applicants with a high GMAT have a slightly better chance of being admitted than an applicant with a high GPA. The difference is so small that it is not very important. 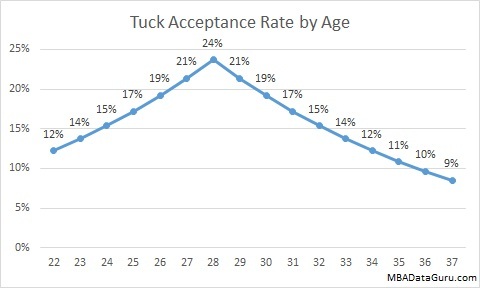 As you can see in the graph above, the round you apply to Tuck does influence acceptance rate significantly. Round 1 and 2 have a similar admission rates of around 24%. Round 3 acceptance rate starts to drop off noticeably to 18% but not much below the 20% average acceptance rate. 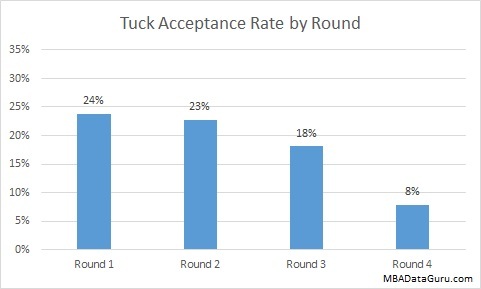 The Tuck acceptance rate for round 4 is extremely low, at 8%. Unless you have an incredible application or are desperate to leave your current job for business school, I recommend avoiding round 4 and waiting for the next year. Tuck values applicants that have a longer work experience. Each year of work experience raises your chance of admission by a little more than 1%. Similar to other schools such as Columbia, Duke, Cornell and Booth, Tuck prefers applicants who are around 28 years old. I believe that this is because they have enough work experience to draw on during school but are not too old to be placed at companies during recruiting. In the above graphs I look at age and years of work experience separately, however in reality they are closely related. 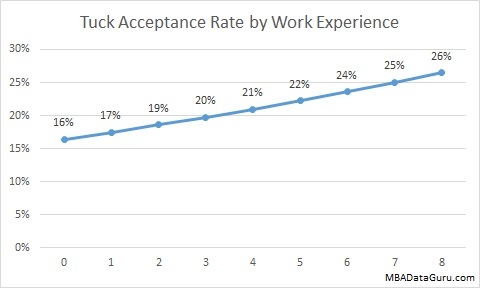 In the graph above I adjusted the original acceptance rate by age graph and added in the impact of work experience. For simplicity I assume that everyone graduates at 22 and works full time from graduation until they apply for business school. When these two factors are combined, you see that older applicants have a large advantage compared to younger applicants. 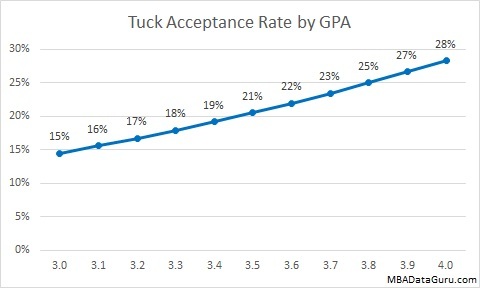 There are a few other factors that affect your chance of admission to Tuck. International applicants (excluding India) have a significantly higher chance of admission, at 28% acceptance rate. Applicants that worked in Venture Capital are especially prized at Tuck, with an impressive 47% chance of admission. If you are thinking of applying to Tuck, be sure to check out my Tuck Interview Question Guide so you know what questions to expect. The data for this analysis came from GMAT Club. This entry was posted in Admissions, GMAT, GPA, MBA and tagged Admissions, Age, GMAT, GPA, Industry, MBA, Tuck, Work Experience on February 19, 2015 by Data Guru. In the article below I found that the acceptance rate for applicants who interview is 42%. I don’t have data on how many initiate their interview verses get invited, but when I spoke to admissions last year, they said that very few applicants who don’t initiate are invited to interview. That seems about right, I figured that failing to initiate an interview was a primary filtering mechanism. Very interesting – this is a pretty granular breakdown. But may I ask where you sourced the data to derive the findings? Did Tuck give you a complete dataset of the 2,500+ people who applied to their program last year? Good question, I wish Dartmouth gave me their full data set. Then I could get even more granular. I am using the data from GMAT Club from the past 3 years, which is a sample size of 914. I only included variables in my model that are statistically significant. I have interviewed with Tuck last Sunday, it went well. I was wondering whether I should expect a admit from Tuck. I have 8 years of experience in IT Consulting (2 Years outside of home country), a GMAT of 740 (Q50, V40) and have spent major part of career (almost 7 years) leading teams. I’m asking this to bring down the anxiety a little bit, wait is just so long till mid-December. Forgive me if I shouldn’t be asking this question here. I would be happy to estimate your chance of admission. What is your GPA? I am an Indian applicant and my university did not grade our papers on GPA scale. I scored 73% in my under-grad, fell 2 short of honors. I am a poet as well and write in my native language. I have lead Volleyball team at regional games and participated in regional Cricket tournament as well. I am mentioning all this just to broaden the data points criteria, as I did in my Tuck application. I attended the University of Phoenix and my gpa was 2.51 in 2009 with a Bachelors in Business Finance. What are my chances of getting into Tuck School of Business? I have not taken the GRE yet. A 2.5 is very low and it was not an elite school either, I think that Tuck will be very hard for you to achieve unless you have something extremely impressive on your resume. Interesting, you would think that Round 1 being Early Action would have a much higher acceptance rate … maybe if the sample size was bigger. Or perhaps Early Action has no benefit.